1931. Bronzeville. Chicago. The mage, Frank "Half Dead" Johnson, is a marked man. Literally. A drunken decision fueled by tragedy has left him with half a soul, sorcerous powers, and two centuries to work off his debt to Scratch (aka The Devil) himself. This graphic novel chronicles three adventures with this tragic conjure man. Watch as "Half Dead" attempts to save his own soul, pay his debt, and help as many people as he can along the way. It's a hard-hitting Hoodoo Noir highball with just a splash of Southern Gothic. Smack-dab in the dark heart of the Windy City. Hold on tight! It's going to be a bumpy ride down Hard Times Road. A Mississippi native and University of Illinois alum, John Jennings is an Associate Professor of Visual Studies at The State University of New York at Buffalo. 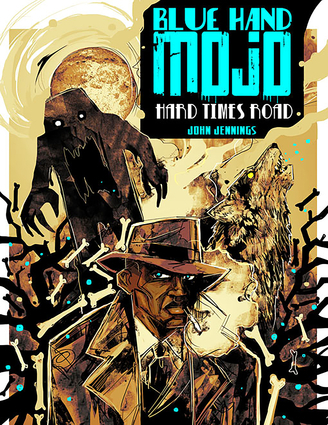 Jennings is an award-winning graphic novelist and author. His research and teaching focus on the analysis, explication, and disruption of African American stereotypes in popular visual media.